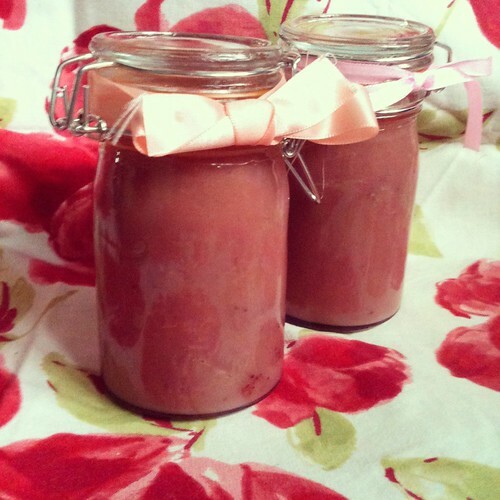 She Dressed in Black: Twee Treats // Strawberry & Rose Curd. Step 3 - Fill a saucepan with water and bring to boil, put the heatproof bowl with strawberries over the pan (water should not be touching the bottom of the bowl) - add the eggs, butter and sugar, stir continuously over a low heat until butter is melted. Step 4 - Turn the heat up a little and then continue to stir for about 10 minutes as the mixture stars to thicken. Step 5 - Pour straight into sterilised jam jars, put in the fridge to chill and set & you're done! We're looking forward to trying out other combos soon! Look out for those! We may even be brave and give jam a go next week. Oh my boyfriend and I have stumbled upon that love! After fumbling around in a book sale once I found a jam book, and ever since them we've been buying bulk fruit from the fruit market and making jams. So much fun!